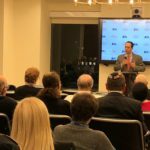 Home > News / Press Release / Uncategorized > Exciting ZOA Inaugural Pre-Gala Event with Israel’s Deputy Ambassador to U.S. Exciting ZOA Inaugural Pre-Gala Event with Israel’s Deputy Ambassador to U.S.
ZOA NY Metro hosted its inaugural Pre-Gala program for ZOA’s elite, society-level donors. The program, Israel in an Evolving Middle East: An Assessment of the Strategic Complex in the Region, was presented on Saturday evening, November 3rd at the Marriott Marquis, Times Square, by Benjamin Krasna, Deputy Head of Mission, the number 2 Post at The Embassy of Israel to the United States. 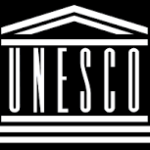 Mr. Krasna has held senior positions in the Foreign Ministry Center for Policy Research, spent time as Deputy Consul General in Istanbul, was spokesman at the U.S. embassy in The Hague, and spent several years as Deputy Consul General of Israel in New York. Mr. Krasna provided an overview of the major players in the Middle East and shared the history and evolution of Israel’s relationships, alliances and challenges in the area. Mr. Krasna referred to the dynamic nature of the Middle East, referring to both long established relationships and newly developing alliances between Israel, her neighbors and the world community. Mr. Krasna is confident in Israel’s ability to defend herself. When asked what we should be doing here in the United States, Mr. Krasna offered two critical suggestions: emphasize Jewish continuity and Jewish education. Don’t let your children take Israel for granted, promote to them a strong connection to Israel. And he firmly suggested making sure all Americans understand why Israel is a valued strategic ally of the United States. The ZOA Pre-Gala program was well attended by select ZOA Donor Society members from across the country. 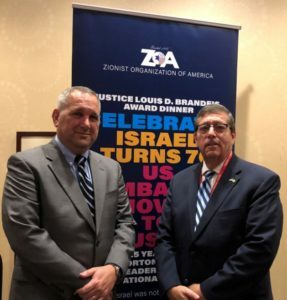 Mr. Krasna was introduced by Mark Levenson, Chairman of the ZOA’s National Board of Directors who spoke of the important work the ZOA is doing and of the special relationship the ZOA has with the current administrations of both Israel and the United States. 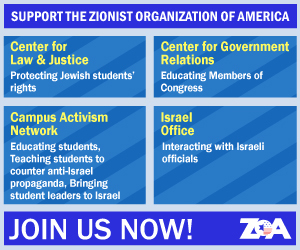 ZOA is working on a schedule of 2019 Donor Society Events for Herzl, Menachem Begin, Brandeis, Jabotinsky & the National Leadership Societies. ZOA NY Metro Team’s October Event A Huge Success!